Here’s how to determine what size outbuilding will best suit your stuff, your style, your property, and your neighborhood. When the time comes to buy a backyard shed, size is one of the most important decisions you’ll make. Surprisingly, the answer to “How big?”—or “How small?”—isn’t simple or cut and dried. Of course, you’ll need to consider the size of your property and how you hope to use the shed, but even those factors have variables. Then there are other considerations that may not readily occur to you. Fear not: This guide will help you put the pieces together so you end up with the right square footage to serve your needs. Just be sure to review these five considerations before you speak to a shed dealer. So many folks today are discovering that a shed can serve as much more than storage. There are a number of ways to enjoy a shed, as long as it’s big enough to suit your purpose. 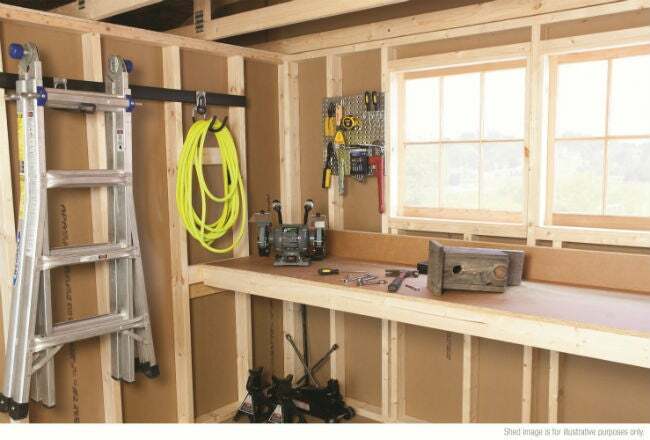 For instance, if you’re hoping to set up a workshop, your shed will need shelving for supplies and storage space for power tools, but you’ll also want a bench large enough for assembling projects and enough room for you to move around comfortably. Remember that shed size isn’t just about length and width—you also have to think about height to make sure you can fit everything in it. For that reason, the shape of your shed also needs to factor into your decision. A barn shed, for example, has a gambrel roof with raised rafters that offer attic storage—ideal if you want to stow above and work below. This handy tool from the shed experts at LP Outdoor Building Solutions can help you see popular sizes of sheds with different roof styles and find free detailed construction plans for your favorite design using their portfolio of high-quality products, including lap siding, wall panels, roof sheathing, and flooring. There’s no denying that a backyard shed is a homeowners’ ultimate storage solution, so get a handle on what, exactly, you expect to keep in there. If it will be devoted to bulky items like a motorcycle or ATV, your shed should be at least 12 feet by 10 feet. But it’s the smaller things that add up—and eat up space. Most people underestimate their storage needs, forgetting, for instance, that they’ll want to stash off-season sports equipment, lawn furniture, or holiday decorations in the shed when not in use. And, once again, account for “me” space so you won’t feel cramped while you’re organizing, arranging, and accessing your stuff. Use the LP size selector tool to estimate how big your shed should be based on your particular storage needs. The calculator includes measurements for common items like lawn mowers, grills, and tools to make the determination easy. Using the size selector tool will help you calculate what size shed you need right now—but will that shed still be the right size in a few years? It might not be a bad idea to size up a bit for the future. After all, you may need a larger footprint as you add to your tool collection, or your kids may get into different sports that require bulkier equipment. Or over time you may decide to change how you use your shed entirely, turning what was once used solely for storage into a gym, office, or shop. 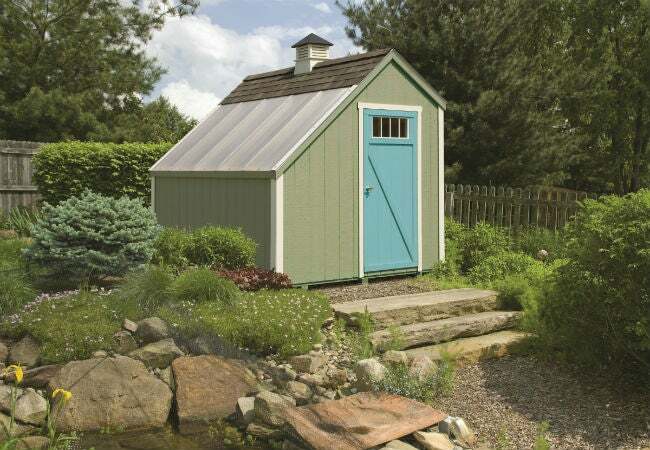 Keep in mind that you needn’t stick to a standard size—shed builders are often happy to accommodate custom requests. Perhaps you dream of a shed as big as a palace, grand enough to hold your possessions with room to spare for you to pursue your passions. Great! Just be sure it will fit in your yard. Generally speaking, a 12-foot-by-12-foot shed will suit a large yard, while an 8-foot-by-10-foot one is better for a medium-size yard. In selecting the size of your shed, you’ll need to think beyond the building itself. Keep in mind that the foundation should be one foot larger than the shed on all sides. You’ll also need to account for setback from property lines, roads, or floodplains. Aesthetics are important too: The shed should look in scale with your property and your home. (Tip: If you want a large shed, consider setting it toward the back of your yard, where it won’t compete with the house.) Finally, think about the landscaping and other features of the yard. Will your shed sit nicely between those two trees? Will it overwhelm the kids’ swing set? Your existing yard layout may influence the optimal size of your shed. Sure, your shed is your castle, but your local municipality and homeowners association (HOA) may very well have a say in its size. Most localities require you to register the placement of a shed with the zoning office before installation, and larger structures might call for a building permit, so plan ahead. HOAs typically set limits on the footprint (for instance, no more than 1 percent of your property) and height of your shed. Refer to your HOA’s covenants, conditions, and restrictions for details before buying a shed.